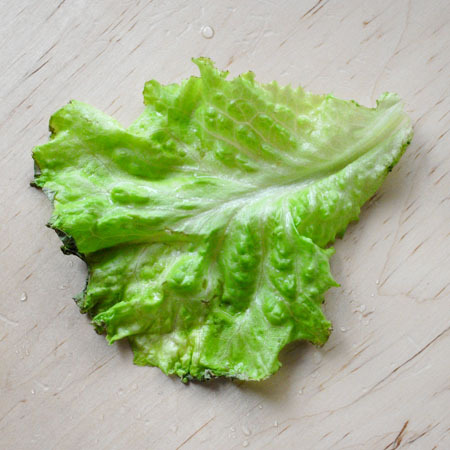 Lettuce should be fresh and crisp but upon storage water will eventually evaporate. The pressure inside the cells drops and the leaves shrink and become less appetizing. 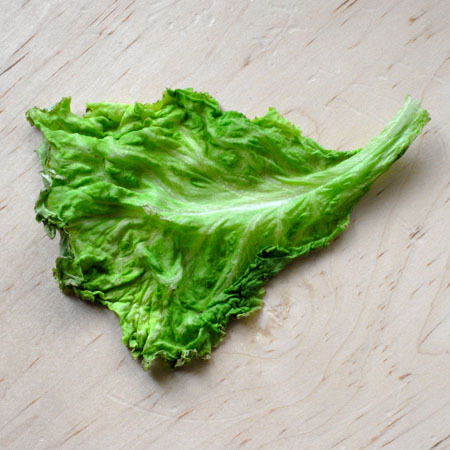 The simple yet effective remedy is to immerse the lettuce leaves in plain, cold tap water. The water will then diffuse back into the cells again. The process is known as osmosis [wikipedia]. For the following experiment I purposly left some lettuce (Lactuca sativa var. crispa, sold in Norway under the name “Rapid”, it’s a Summer Crisp/Batavian cultivar) to really dry out as you can see from the picture. After approximately 4 hours in water the leaf looks like this. Notice that along the rim the leaf was so dry that the cells were damaged “beyond repair”. To illustrate this relatively slow process I set my camera to take a picture every minute and left it for almost 4 hours. I then stiched it together and the resulting time lapse movie shows the process speeded up 720x (click if the embedded video won’t work).